V&A Jewellery - The inspiration for this range of delightful blue and white jewellery is a transfer-printed patterned plate, in Japanese style, produced in Hanley, Staffordshire in 1875-85. The original design was called ‘Andalusia’ which is peculiar, given the clear oriental flavour! However, it was rare to give a name which was relevant to the design in Victorian ceramics. This jewellery features the painting from the plate reproduced onto shell mother-of-pearl and inlaid into sterling silver. 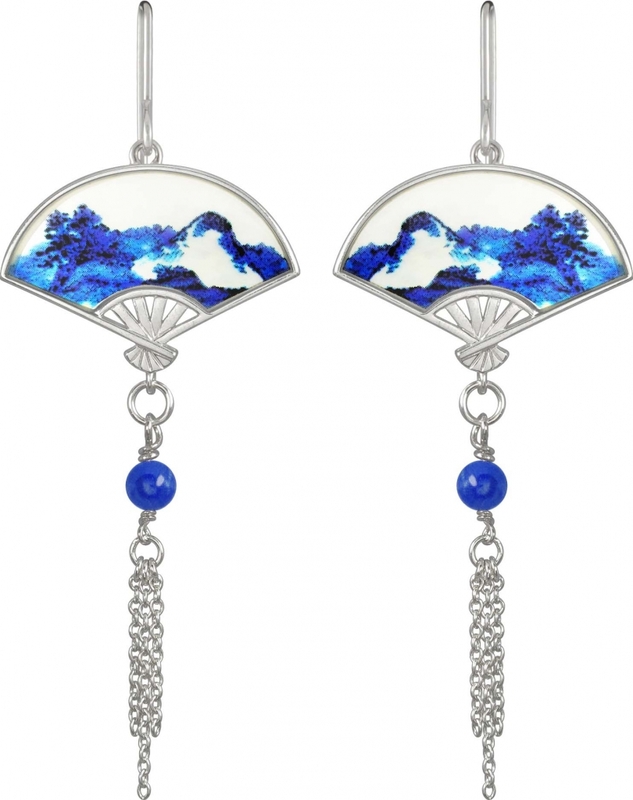 Blue lapis lazuli droplets from the fans add a graceful adornment. This piece was inspired from an object in The Victoria and Albert Museum, London. V&A Jewellery - The wings of an angel are traditionally a very potent image, evoking peace, love, protection and blessing. V&A Jewellery - Inspired by an unfinished flounce in needle lace, this exquisite range of fine jewellery has all the charm and intricacy of the highest quality lacework. V&A Jewellery - Gothic quatrefoil range - a quatrefoil is literally a representation of a four-leaved plant or flower and features very prominently in gothic architecture as a decorative symmetrical shape created by four overlapping circles. V&S Jewellery - The inspiration for this range of delightful blue and white jewellery is a transfer-printed patterned plate, in Japanese style, produced in Hanley, Staffordshire in 1875-85. V&A Jewellery - This piece was inspired from an object in The Victoria and Albert Museum, London. A gold-plated and enamelled pendant, perfectly detailed in the form of a bunch of purple grapes and green vine leaves, each element separately attached to give natural movement.